Have questions about mobility scooters? Check out our new mobility scooter information center. For a quick search, you can use the search below. For a more detailed search, our Scooter Wizard can help you find the perfect scooter for you. Not every person who has mobility difficulties needs a manual wheelchair or power wheelchair. You may still feel confident when walking around your home and yard but prefer the stability of a wheeled ride when you go out, or you might just need a lift due to a medical condition that is exacerbated by long periods of walking, such as cardiopulmonary deficiencies or arthritis. Whatever your reason, a mobility scooter offers the convenience of a wheeled mobility aid with a higher potential for customization than a wheelchair. Mobility scooters also have higher top speeds than electric wheelchairs do, so if you want to be able to travel to your destination more quickly, a mobility scooter is the way to go if your medical needs allow for it. Our team of mobility scooter specialists is always eager to answer your questions about our scooters and help you find the mobility scooter that will best satisfy your transportation needs. To speak with a representative, please call 1 (800) 794-9240 today. Travel mobility scooters are lightweight and maneuverable. They are usually made to either fold or be disassembled for better portability, allowing you to load most of these scooters into a car so you don't have to use a vehicle lift to carry your mobility scooter with you on trips away from home. 3 wheel mobility scooters require less space to turn around than their 4 wheel counterparts, but are usually not as stable as 4 wheel models. We recommend 3 wheel scooters for people who will mainly be using their mobility scooter indoors. 4 wheel mobility scooters have less maneuverability than 3 wheel models and require more room to turn around, but their stable wheel bases lessen the likelihood of the scooter turning over during operation. 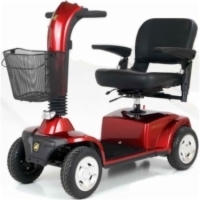 We recommend 4 wheel scooters to customers seeking a versatile mobility aid that can operate well both indoors and outdoors. Heavy duty mobility scooters are designed to handle rough terrain and carry heavier weight loads than the various smaller scooter models. Extra wide wheelbases and high ground clearance allow these mobility scooters to go places others can't. 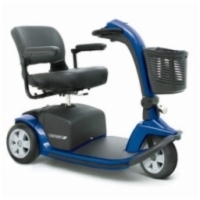 Ruggedness: If you live near shopping centers and other amenities in an urban area with well-paved roads and maintained sidewalks, you don't have to worry as much about factors like how far off the ground your mobility scooter rides or how far the scooter can travel on a single battery charge. However, rural users, who may need to use a mobility scooter over uneven ground or travel longer distances, will certainly want a scooter with a higher ground clearance and range per charge. Maneuverability: A mobility scooter's turning radius - the distance required for the scooter to turn around a complete 180 degrees - ranges from as little as 31 inches to as much as 72 inches. When choosing your mobility scooter, think about the places in which you're most likely to use it. You can even use a tape measure in those places to get an estimation of how small of a turning radius you need to navigate hallways, store aisles, and other tight spaces you may travel. Portability: Many travel mobility scooters are designed to break down into separate pieces or even fold in order to ease the process of transporting them in a car, SUV, truck, or van. 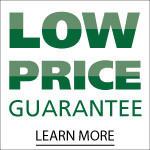 If your mobility needs require you to buy a non-travel model, you may also need to purchase a vehicle lift to transport your mobility scooter in or behind your vehicle. 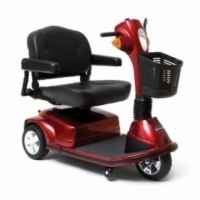 Safety: Most of the mobility scooters we sell can have safety belts added to the seats for under $50.00, and belts sizes are available in lengths up to 70 inches. Other features, such as turning signals and headlights, may not be available on all models. While browsing our site, pay particular attention to the product features to ensure that the safety features you require are available on the mobility scooter of your choice; if you're in doubt as to whether a particular model has the features you want or need, please don't hesitate to call our scooter specialists at 1 (800) 794-9240. Speed: Most travel-sized mobility scooters have top speeds between 3 and 5 miles per hour. Larger heavy-duty models will range from 5 to 10 miles per hour. Not everyone is comfortable with traveling at such high speeds, however, so keep in mind the level of speed at which you feel comfortable traveling as you shop for a mobility scooter. Weight Capacity: The necessary weight capacity isn't just a function of your body weight; if you want to take your scooter on trips to the grocery store, or you think a child or grandchild might want to ride in your lap, you'll want to factor that into your calculations, too. Most travel mobility scooters support weight loads of about 250 pounds, though a few can carry as much as 275 lbs. 3 wheel and 4 wheel mobility scooters can support 300-350 lbs. Heavy duty mobility scooters can usually hold up to 500 lbs. 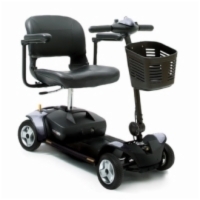 US Medical Supplies carries a wide variety of optional accessories for your mobility scooter. 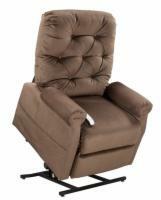 We offer strap-on bags for armrests and tillers, under seat glove boxes for discreet storage of valuables, color change panels to accentuate your personal style as you ride, and replacement batteries and chargers to keep your mobility scooter going. Check out our selection of portable ramps for getting over pesky height obstructions, and see our offering of personal covers that protect you, the rider, from windburn and rainfall.